Ireland’s Wild Atlantic Way coastal road up the west side of the country runs for over 1,550 miles but official overnight stopping places for motorhomes are few and far between. 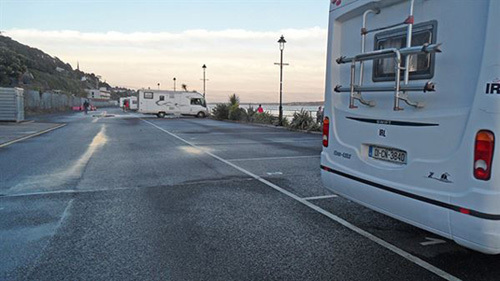 One newly created facility, an overnight, 30-place parking bay at the Cobh waterfront, south of Cork in Ireland is already under threat from caravan park owners in the east Cork area. The Cobh-Glanmire Municipal District council created the harbour-side spaces for overnight parking and the disposal of waste water. When it published new bye laws to control the motorhome parking in the town, including at the new facility, local caravan park owners wrote to the council claiming that the local authority’s model was illegal and anti-competitive. The park owners are threatening legal action if it isn’t closed. The municipal authority has referred the correspondence to its legal department in case of a challenge in the courts.